We'll clean your rugs along with your carpet! Don’t you love the way an area rug can change the look and feel of a room? While area rugs are a beautiful addition to any room, they receive a lot of traffic and can quickly become dirty. Let Van’s Chem-Dry renew the patterns and colors of your area rugs with our area rug cleaning service. The professional technicians at Van’s Chem-Dry can restore practically any rug back to its original beauty with a thorough cleaning. Our cleaning products are virtually residue free, which will help keep your rugs cleaner, longer. With an application of Chem-Dry Protectant, your rugs will stand up better against the spills and spots of everyday life. Let the focus of your room be a beautiful oriental rug that doesn’t also show off how often you track through that area with dirty feet and food. Your oriental and area rugs are very valuable investments. That’s why Van’s Chem-Dry technicians always clean them with care and attention to detail. Utilizing the basic elements of air and naturally carbonating water, we take advantage of specialized cleaning tools and equipment designed for area rugs. Our specialized drying technique will minimize wicking and preserve the dye within the fibers of your rug. Because of the calculated and tested process we use, we’re able to restore the beautiful colors of your area rug with a gentle technique that doesn’t car undue wear and tear to the fabric. 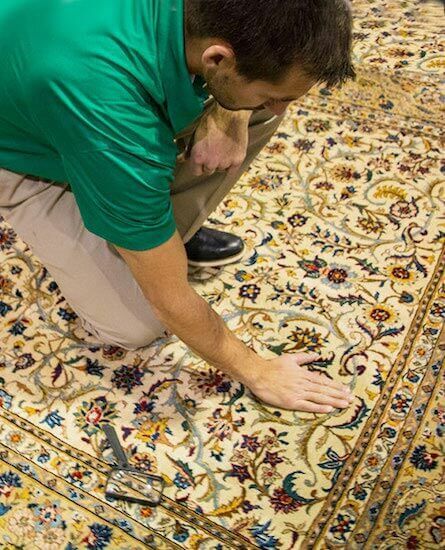 Our expert technicians will evaluate your rug and implement an effective process for area rug cleaning. Our process typically includes a pre-spray cleaner, a gentle submersion bath, and expert drying and fringe cleaning. Chem-Dry ensures your rugs are carefully handled and cleaned only by our certified, trained specialists. They are experts in area rug cleaning and perform a thorough evaluation to determine the safest, most effective method of cleaning your valuable rug, whether it needs to be cleaned in your home or at our facility to achieve optimum results. Due to the numerous varieties of rugs available for purchase, Van’s Chem-Dry is happy to provide a detailed analysis of the cleaning and free, no-obligation estimate of the service upon arrival.